This program concentrates on dealing with people who show unacceptably aggressive behaviour – shouting, threatening, and swearing. Without proper handling such people can become physically violent and cause injury to you, other people or property. The program looks at the skills of restraint and some other interpersonal skills that can help you to successfully manage these potentially dangerous situations. The course gives you a step by step guide to diffusing potentially dangerous situations and suggests ways that you can create win/win situations to solve the issues raised. 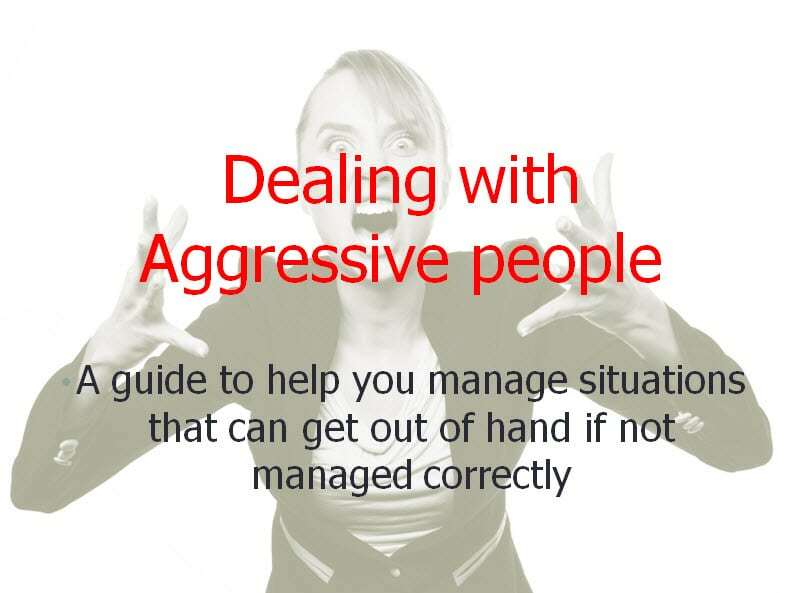 This course is designed for anyone who deals with the public and is a guide to managing situations that can get out of hand unless managed correctly. The program also covers what to do if your attempts to diffuse the situation fail and it becomes necessary to escalate the situation and have the aggressive person leave or be removed from your premises. The course ends with the need for a debrief after an event occurs and covers ways of managing the personal stresses that can result from an event like this. The program is followed by a quiz which requires a pass mark of 80% to be considered competent. A certificate is available to print off on satisfactory completion of the course and the quiz.